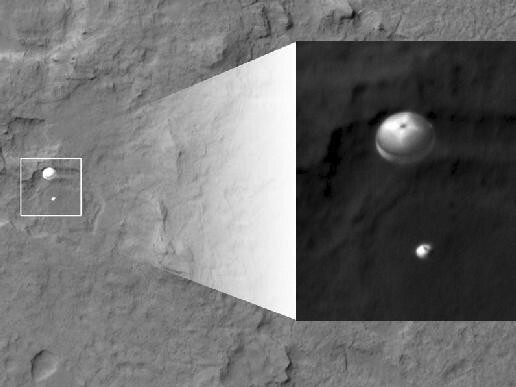 My favorite image from Curiosity's landing, taken from over 200 miles away by NASA's Mars Reconnaissance Orbiter, shows Curiosity a minute before landing, dangling beneath its 51-foot diameter parachute about two miles above Gale Crater. The odds were stacked against the Mars Science Laboratory, aka Curiosity, which represented the 17th attempt by Earthlings to land a spacecraft on the surface of the Red Planet. Only seven of the previous 16 had succeeded, so when it did touch down safely last Aug. 5, at 10:32 p.m. PDT, after by far the most complicated landing system ever ("Seven Minutes of Terror"), you could hear the collective sigh of relief from space-watchers around the world. Curiosity is the fourth successful rover on Mars, preceded by tiny Sojourner, which hitched a ride to the Martian surface on the Pathfinder lander, and by the twin Mars Exploration Rovers A and B, dubbed Spirit and Opportunity. Opportunity landed on Jan. 25, 2004, and -- incredibly, given the mission's nominal three-month duration -- is still operational. Pathfinder, Spirit and Opportunity all landed using airbags to cushion their arrival on Mars, after decelerating through the thin Martian atmosphere using supersonic parachutes and retro-rockets. In contrast with these earlier rovers, Curiosity presented much more of a landing challenge, mainly because of its one-ton weight, compared with Sojourner's 23 pounds and Spirit and Opportunity's 400 pounds. That's why the landing sequence was so complicated. It was too heavy for airbags and too vulnerable for a retro-rocket landing, since if it had landed using rockets all the way to the surface, the resulting dust might have damaged the complicated machine. Curiosity isn't designed to search for life, but to look for suitable conditions for life as it might have evolved some 3 billion years ago, when Mars had oceans and was something of a sister planet to Earth. Mars later froze (unlike Earth, it's too small to maintain an internal heat source), but some of us still dream of discovering some hardy little buggers nestled for warmth deep within the flanks of a still-warm volcano. Curiosity isn't going to find all the answers about possible Martian life, but it will at least lead us in the right direction. Barry Evans (barryevans9@yahoo.com) didn't realize he could hold his breath for seven minutes until the evening of Aug. 5.